In a stunning decision made worse by the length of time it took to be handed down, the Supreme Court of El Salvador denied a young woman "permission" on Wednesday for an abortion needed to save her life. "We are all Beatriz and we repudiate the Supreme Court." Petition His Holiness Pope Francis for Beatriz’s life here. In a stunning decision made worse by the length of time it took to be handed down, the Supreme Court of El Salvador gave a young woman a death sentence on Wednesday by denying “permission” for an abortion needed to save her life. In a letter addressed to the Supreme Court last month, Health Minister María Isabel Rodríguez described Beatriz’s situation as “grave maternal illness with a high probability of deterioration or maternal death.” Given the fatal prognosis of the fetus, “it is necessary to undertake a medical-legal approach urgently,” Ms. Rodríguez wrote. This was no routine medical recommendation: Abortion is banned in El Salvador without exception, and both physicians providing and women receiving abortions can be imprisoned for many years. It is thus not often that physicians, much less the minister of health, are willing to put themselves at risk even when a woman’s life is in danger. And in part as a result of these realities, maternal mortality in El Salvador remains very high. Beatriz could have had an abortion before the end of her first trimester, and we likely would never have heard of her. But the country’s attorney general asserted he would indeed prosecute the case if the doctors performed an abortion, and so a cruel and confusing international circus began. Next, advocates took the case to international bodies, which quickly called on the government of El Salvador to provide Beatriz with the health care she needs. Both the Office of the United Nations High Commissioner for Human Rights and the Inter-American Commission on Human Rights (IACHR) weighed in; the Office of the High Commissioner called the situation “cruel, inhuman, and degrading.” The IACHR gave the government 72 hours to comply with its findings. But the President again did nothing. Meanwhile, Catholic bishops in the country joined by members of the political right started to ratchet up the opposition to providing Beatriz with life-saving health care, further underscoring how little her life means to them. Today, as reported by the New York Times, the court ruled 4-to-1 against saving Beatriz’s life, citing the country’s legal “absolute impediment to authorize the practice of abortion.” The court ruled that “the rights of the mother cannot be privileged over those” of the fetus. 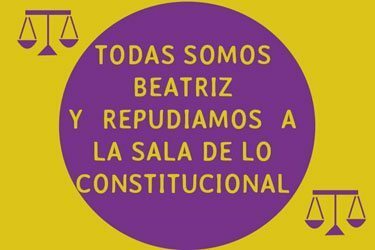 “The refusal of the Salvadoran Supreme Court to allow Beatriz to obtain a medical procedure that could save her life is an appalling and disgraceful violation of her fundamental human rights,” said Lilian Sepúlveda, director of the global legal program at the Center for Reproductive Rights. El Salvador’s ban has not only resulted in the denial of medically-necessary abortions for women like Beatriz who desperately need them, but also in the imprisonment of far too many women who have suffered miscarriages or obstetric complications. Salvadoran women have been paying an unacceptably high price for El Salvador’s abortion ban. Women should never lose their fundamental rights, or be subject to such cruel and inhuman treatment, simply because they have become pregnant. In other words, a woman has no rights. She is not counted among those “human beings” noted by de Cardenal. Even when “the fetus” has no chance to live.